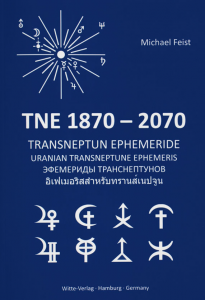 The "Uranian Transneptune Ephemeris 1870-2070" includes positions of all eight astrological calculated hypothetical Transneptunian Planets of the Hamburg School of Astrology (Uranian System of Astrology). 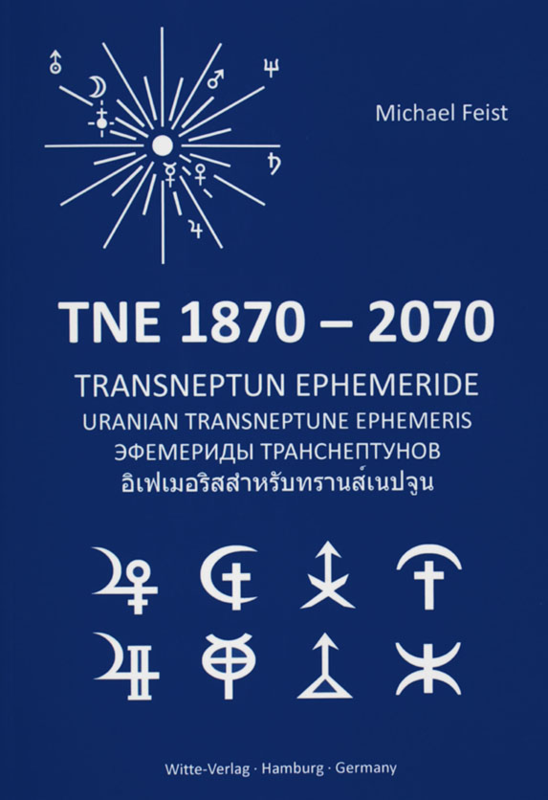 These re-compiled edition based on the official Hamburg Edition 2000, which take into account the orbital elements by James Neely. It is available in a handy A5 format (14,8 x 21 x 1,6 cm). The positions in these midnight ephemeris are presented in 5-day intervals, always beginning with each January 1. The positions for one year are complete on one page of the ephemeris, and when appropriate, a day of the following year is included on this page. The introduction part will inform about the historical background in four languages (German, English, Russian and Thai). Also the astrological properties of the Transneptunians Cupido, Hades, Zeus, Kronos, Apollon, Admetos, Vulkanus and Poseidon are given here. Alfred Witte established Cupido, Hades, Zeus, Kronos in the years 1923-1924. Friedrich Sieggrun established Apollon, Admetos, Vulcanus in 1927 and Poseidon in 1934. Michael Feist (author) is grandson of Alfred Witte's collaborator and publisher Ludwig Rudolph and one of seven family members who were educated in Witte's Astrology. He is Hamburg School expert for the historical development of Uranian Astrology and the astrological Transneptunians. Введение содержит материал по истории Транснептунов ГШ, затрагивает вопросы их расчёта и работы с ними. Михаэль Файст - внук соратника Альфреда Витте и издателя Людвига Рудольфа, племянник Удо Рудольфа и т.д. – приводит здесь также и цитаты из первоисточников. Введение и др. информация в данной книге выполнены на четырёх языках: немецком, английском, русском и тайском.